Can you colour yourself in glory with Epson's 6-ink photo printer? 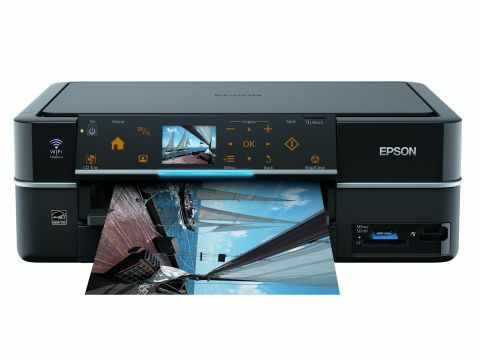 One of the most expensive A4 all-in-one printers on the market, the Epson PX720WD goes a long way to justify its price tag and running costs are pretty reasonable. Ultimately, however, the 6-ink system doesn't really deliver noticeably better photo quality than some of Canon's cheaper 5-ink printers. A stickler for tradition, Epson's PX720WD resists the temptation of settling for five inks, as found in the likes of the Canon PIXMA MG5150 and HP Photosmart Premium C309G. So instead of getting both dye-based and pigment-based black inks as a compromise between document and photo printing, the Epson goes for the full 6-ink monty. Billed as an all-in-one for photo enthusiasts, it serves up the conventional mix of CMYK dye-based inks, along with additional light cyan and light magenta inks, boasting an enhanced colour range for truly photo-realistic output. At least, that's the theory. Running on Epson's latest generation of Claria inks, each in individually replaceable cartridges, the PX720WD runs true to form with a 5760dpi resolution that's typical of Epson printers, joined at the hip to a high-resolution 4800dpi scanner that enables mono or colour photocopying as well as scanning. Indeed, these and most other specifications are identical to the PX710W that we've reviewed previously. For example, you get USB, Ethernet and Wi-Fi connectivity, along with a wide range of media card slots that include compatibility with CF, SD, SDHC, MMC, MS and xD formats. But there are a couple of notable differences too. One of our criticisms of the PX710W was that it had a barrage of buttons cluttering the front panel, making standalone use a little counter-intuitive. That's now been replaced by a touch-sensitive panel in which individual icons are only illuminated as and when they're active, somewhat simplifying the process. It's not as slick as the full-colour touch-screen LCDs of printers like the Lexmark Interact S605 or the HP Photosmart Premium C309G, but it's definitely a step in the right direction, and overall the menu system is quite intuitive. It's a little strange to find an auto duplex on a printer that's designed for photo output rather than document printing, but considering the PX720WD lacks a pigment-based black ink, mono text is reasonably crisp and solid-looking, at least compared with the feint grey that's often associated with photo printers. Other extras include a neat CD/DVD tray for direct printing onto white-faced discs. Print speeds are very respectable in standard photo quality mode, with 6x4-inch prints taking about 20 seconds a piece. Top quality mode drags the speed down to about three minutes per borderless A4 print, but that's quicker than with some of Epson's photo printers, like the P50. When it comes to image quality there's plenty of contrast, and colour rendition is good, although skin tones aren't particularly flattering. Photo prints tend to look very punchy, but sometimes at the expense of a slight loss of detail in highlights and lowlights. Running costs are slightly lower than average, which is a bonus considering there are six cartridges under the bonnet, rather than just four or five.